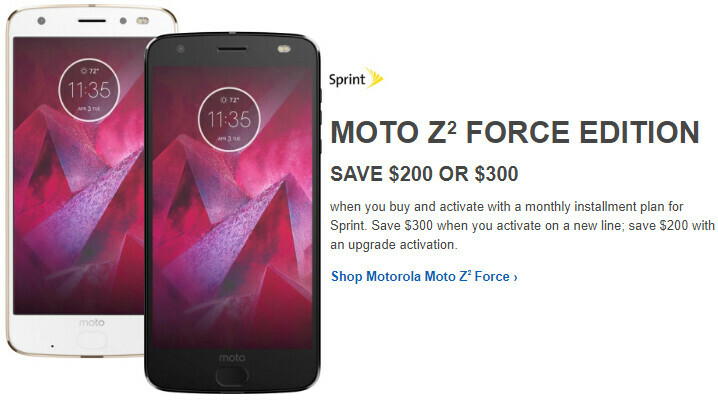 As of this week, Sprint is accepting pre-orders for the brand new Motorola Moto Z2 Force, and it's even got a pretty sweet offer for folks willing to lease the phone: 2 handsets can be leased for the price of 1. However, if you want to actually purchase the Z2 Force (and own it, instead of just leasing it), Best Buy has a deal for you. Normally, the Moto Z2 Force costs $792 at Sprint, but Best Buy lets you pay just $492 for it (that's $300 off). This offer requires "eligible" new line activation and a Sprint 24-month installment billing plan. If you only need to upgrade an existing line on a 24-month installment, you can still save some money, but just $200, paying $592 for the Z2 Force. In both cases (new line, and upgrade), savings will be "reflected in reduced monthly payments over the life of the device." If you take advantage of Best Buy's deal - which can be found at the source link below - you're still entitled to receive the free JBL SoundBoost Moto Mod that Motorola and all carriers are offering with the Z2 Force. As a reminder, the Moto Z2 Force will start shipping on August 10, running Android 7.1 Nougat out of the box. This is Motorola's most advanced smartphone to date, featuring stuff like a 5.5-inch Quad HD ShatterShield (unbreakable) display, a Qualcomm Snapdragon 835 processor, and a dual 12 MP rear camera. You can find out much more about the device from our Moto Z2 Force hands-on - video included.